Not a Subscriber to the Insider Tracking Service? Readers of the daily Insider newsletter are eligible for a free trial. Request your free trial now! The Insider Legislative Tracking Service combines cutting-edge database technology with an easy-to-use, web-based interface to provide a comprehensive solution to the tracking needs of government affairs professionals. It allows you to produce tracking reports in Microsoft Word format, see daily and weekly legislative calendars that show exactly when and where your bills are scheduled, receive emails whenever your bills are added to calendars, click directly to the exact sub-sections of the General Statutes cited in proposed legislation, receive email notifications when committee substitutes of your bills come out, and much more. An enormous resource of legislative information, updated continuously every day: bill history, bill text (including bill in editable Rich Text Format), committee agendas, public hearing notices, press releases, voting records, legislator contact information, and much more. Our tracking system allows you to track an unlimited number of bills and organize them into separate lists as needed (by client, subject, person, etc.) Additional fields such as position, priority, category and comments allow you to personalize your reports to fit a variety of needs. Our exclusive Daily Alert feature scans the entire service for all new information affecting you, including news releases, meeting notices, schedule changes, actions, bill text, votes, sponsorship changes, bills in your favorite subjects, bill text containing your favorite keywords, and more. Daily, weekly and monthly views of scheduled meetings and sessions, with your bills marked for easy reference. Create customized, personal calendars for any legislative day in a single click. See how far your bills have gone in the legislative process (including status and last date of action) with this unique, chart-like report. Enter your favorite search terms once and be alerted automatically every day when new bills are introduced that contain your keywords. You will also be alerted when bills are amended with new language that contains one or more of your saved keywords. Send tracking reports, bill text, press releases, meeting agendas and other documents directly to your clients without having to save files and send them yourself. Create desktop-publishing quality tracking reports with proportional fonts, multiple columns, definable fields, and more. Reports can be created in both HTML (web page) and Microsoft Word formats. See only the bills you want, in the order you want! Now you can show just the bills that are scheduled, near the Governor (near passage), signed into law, recently introduced, etc. Bills can also be sorted in numerous ways such as last date of action, progress, date introduced, your position / priority / category, and much more. See how one or more legislators voted on virtually any group bills � by subject, date of action, keyword search, tracked bills, and more. You can even compare multiple legislators side-by-side, and/or compare their votes against your client's or organization's positions. 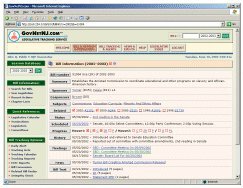 The most powerful legislative search functions ever created! Search by keywords in bill text, sponsor, cosponsor, status, subject, date of action, date introduced, progress, action type, scheduled date, your tracking list / position / priority / category, and more. All search fields can be used alone or in combination, allowing you to do truly complex searches in just a few mouse clicks! Hundreds of thousands of cross-referenced links make it easy to go exactly where you want to go. Features that would typically require many menus or sublevels are combined into simple, concise pages of related links and options. Access your tracking information no matter where you are, any time of the day or night. All you need is an Internet connection and a web browser. Multiple users in the same organization can share an account, even if they are not in the same physical location. Information entered by one user is instantly available to all other users on the same account. How much does the Tracking Service cost? Does the Tracking Service include the Insider newsletter? How does the free trial for Insider customers work? How does the free trial for people who are not Insider customers work? How do I build a series of Tracking Reports? How to I compile a single list of all the bills I'm tracking, regardless of their Tracking List? How do I print a Calendar showing where by bills are scheduled to come up? Where is the Report that shows all the actions from the previous day? How can I get caught up after I've been out of town? What is a new bill? If a bill appears in my Daily Alert email because it matches a parameter I have set, does it automatically become a Tracked Bill? What is the difference between Bill Comments and Tracking Notes? Why shouldn't I just have one large Tracking List like I used to, called something like "My Bills"? What is the different between Tracked and Untracked Bills? Should I use the Position, Category, and Priority fields? Can I create my own Positions, Categories and Priority fields? What's the difference between the various emails? What is the difference between a Tracking Report and a Progress Report? Can I get my Tracking List names to appear on my Progress Reports. What is the Related Bill Finder? What does the Integrity Check do? Is there a way to compile lists of bills assigned to a particular lobbyist, regardless of client? The service costs $1,800 a year for a base account. Additional users can be added for $300 a year. Insider customers are eligible for a free two-week trial of the service. Let us know that you are interested, and we'll set up a fully functional account in your name. We'll also help you put "bills of interest" into the system so you can see it in action. If you do not provide us with bills, we'll create a Tracking List with some sample bills for you. The free trial costs you nothing and you are under no future obligation. Simply send an email to us at service@ncinsider.com requesting approval for a free trial. Be sure to include your name, your telephone number, and the name of your company, agency or association. If approved, we'll set up a fully functional account in your name. We'll also help you put "bills of interest" into the system so you can see it in action. If you do not provide us with bills, we'll create a Tracking List with some sample bills for you. The free trial costs you nothing and you are under no future obligation. After clicking the Tracking Reports link on the left side of the page, select the tracking lists you want to use while by clicking them holding down the "CTRL" key. Select information fields you wish to include in your reports, and set your format (HTML, Word document, RTF) and display options, then build all the reports with a single click of the "Create Report" button. To build a single report with all your tracked bills, see the next question. Use the "Search for Bills" link on the left side of the page and click the "Select Lists" link on the "Tracking List" line of the search screen. Put checks in the boxes of all the lists you wish to include in your report and click "Select." Execute your search and all the bills within the selected lists will be found. Use Search for Bills to isolate the tracked bills you are interested in, then build a report after limiting your results to "Scheduled Bills." It is called the Session Day Review and is indexed in the News & Events section of the web site. You can also set your Emails Alerts options to have it emailed to you every day. Use the Search for Bills screen and select the Action Date option. Put a check beside the days you missed and run a search. The results will show every bill that had action while you were gone. You can also use the Tracking List option on the search page to limit your results to just the bills you are tracking. Also, the Session Day Reviews capture everything and are archived. If you use those, however, you can't immediately add bills of interest to your tracks, so it's worthwhile to become comfortable working in the database. new versions of older bills. For instance, a Daily Alert filter set to look for bills that contain the word "hospital" would search all new bills as well as committee substitutes for untracked bills. Absolutely not. The Daily Alert is searching new bills for anything that matches the interest parameters you have set. It will pop up in your Daily Alert when it is new, but be gone the next day unless you take action. Sound users find it useful to create a Tracking List where they can park bills they intend to look at more closely when time allows. If your Daily Alert filters snag three new bills that may or may not prove to be worth tracking, you can park them in a Tracking List called something like "potential bills" and take a closer look on Friday when things slow down. Both are specific to a particular bill. Bills Comments are associated with bills regardless of context, so the comment for a bill can be displayed in any report. T racking Notes are particular to the bill within the context of the Tracking List in which the note was created. So the same bill, tracked for different clients, can have different notes in the reports built specifically for each client. Administrative reports created to show all the bills you are tracking can display both the bill comments and all tracking notes. Because throughout the system (on reports, bill pages, legislative calendars, etc.) your tracking names are going to appear, so it is good to use that field for a piece of information that tells you something. Having "Agency Bills" appear is also better than "My Bills" when reports get circulated. By adding a bill to a tracking list, you are letting the system know that you are interested in that bill's progress. Once a bill is given tracked status you can set the system to let you know anytime the bill is scheduled for the floor or for committee, anytime a vote is taken or the bill has any other action, any time the text is replaced with an updated version due to committee substitution or floor amendment. Throughout the day you can check the Daily Alert is see the latest information about you bills, and the same material can be collected and emailed to you every night. You can build easily customized tracking reports by topic or client by using multiple tracking lists. Tracked bills appear with a red-boxed checkmark icon throughout the site. It depends on the complexity of your lists. Some people only track bills they consider to be high priority and work for an agency or association with a very narrow area of interest. They may set the system to send an immediate email any time there is action of any sort on one of their bills. Other firms may have three dozen clients, three or four lobbyists, several specialty areas and thousands of bills that are being monitored and reported on due to their potential impact. An association may occasionally wish to print reports for members to take with them to the legislature. The reports can state whether the association is supporting or opposing a list of committee bills and use the Bill Comments field to list to provide talking points. Consider the grid below. It lists only four bills, but could just as easily list 40. Or 400. Firms and agencies with multiple lobbyists sometime like to use the category field to define to whom the bill is assigned. Doing so allows reports to be built showing only the bills assigned to a particular person. Thus, a report should only scheduled bills with the category "Chet" would, in essence, serve as Chet's calendar for the day. Yes, very easily. Just click the "Add Position" (or Category, Priority) link in the "Options" link on the appropriate page. Daily Alert - A complete recap of the previous day's activity. 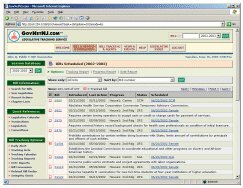 This report lists all information on tracked bills and catches all the new or updated bills that match the criteria set in your search features (Subject, Keyword, Citations). Session Day Review - A formatted, printable report containing all actions and introductions from the most recent legislative session day. This is a report some people like to print out. Allows you to peruse all actions from the day before without any partiality being shown to tracked bills. Yes. We can toggle that feature on for you if you like. Generally, however, the Progress Report is intended to be as quick a read as possible. Finds untracked companion bills to the bills you are tracking and adds them to the same tracking list. Keeps a record of added bills for administrative purposes. Identifies and reports conflicts in your positions. If you are supporting a bill for Client A while your partner is opposing it on behalf of Client Z, you should be aware of that. Only if you use the category field or the tracking list names to indicate who a bill is assigned to. Deciding how to best set up and organize your tracking names is beyond the scope of this FAQ, so feel free to contact us for a consultation. © Copyright 2014 The Insider. Any reproduction or retransmission of The Insider North Carolina State Government News Service, in whole or in part, is a violation of federal law and strictly prohibited without permission. All rights reserved.